Who Needs A Diesel Gala!!!! Before I start a couple of parish notices. Firstly I have been contacted by an operator explaining why there was a lack of attendance from local operators at the recent Ipswich Bus Rally. I now understand the situation and apologise to the operators I criticised. I hope the situation can be resolved so next year's event can be better attended for the sake of the organisers and visiting public. It was not, I must emphasise due to a lack of willingness from the operators or lack of enthusiastic drivers. Secondly I think I have identified my anonymous abuser. The same name has been suggested by more than one party. I'm delighted it's no one of any importance within the industry whatsoever, and I will no longer subject you to his insane and spiteful rantings. I'm sorry I had to in the first place but I thought that might be the only way to get hm unmasked as others would recognise his style. It seems to have worked so let's all move on. He's not worth it. Tim and I were due to camp out at Kimberley Park today, watching diesels of many shapes and colours go past as part of Mid Norfolk Railway's Spring Diesel Gala. However, due to circumstances way beyond MNR's control, nearly all the visiting locos had to pull out, meaning the event was severely reduced, and MNR are hoping to reschedule the gala for later in the year. 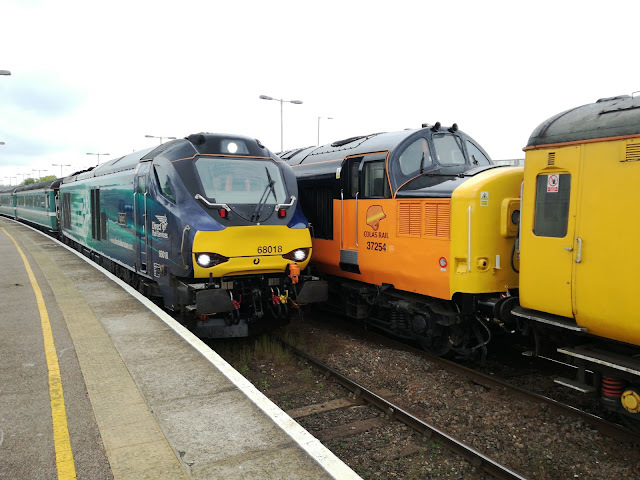 DRS saved the day by sending 37424 (558) and 57007 but there were no 31's, 56's or whatever Rail Operations Group were going to send, so we decided not to go, particularly taking into account the mainline Diesel Gala we witnessed on Thursday. The network Rail Test Train comes to our area every 4 weeks. 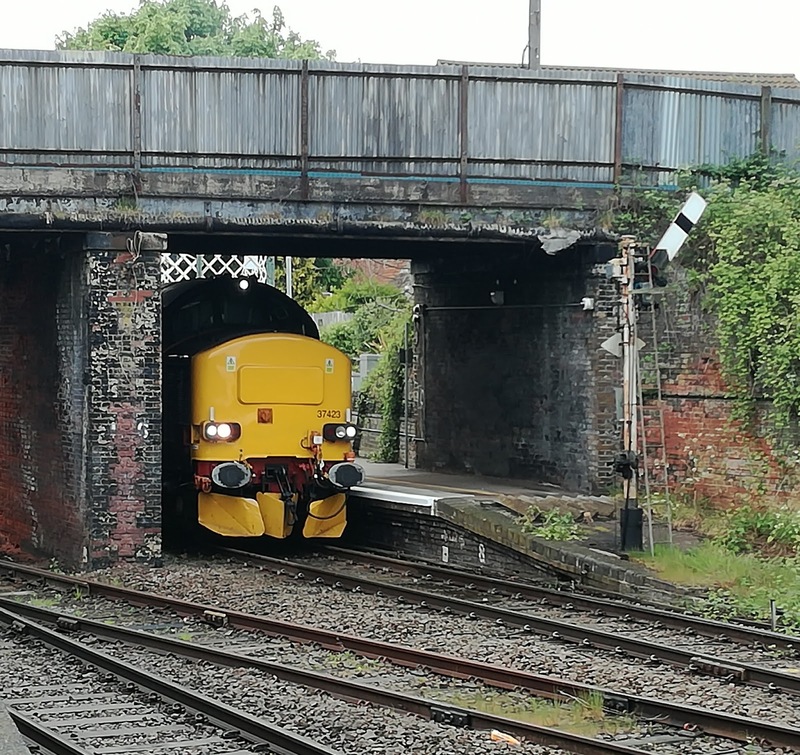 However it starts the week away from its base in Derby on the Monday, passing Railcam's Peterborough camera, so we know what locos to expect well in advance. A treat was in store this week with the freshly repainted 37254 and what I confess to be my favourite loco of any class, anywhere, green 37057. I was determined to snap this train in more locations than ever, so after spending the morning on social duties taking an elderly friend (no, not Tim) shopping and hospital visiting I sought my first location to the west of Trowse Jct by the river. A nice calm spot I will certainly use again, but before the 37's arrived I found myself in a field of very tall grass and got a couple of East Midlands Class 158's passing from an unusual angle. Decided that would be no good for the 37's so went back to the river and waited for the tell tale rumble. It was at this point a family of squirrels - 5 of them decided to have playtime in the tree above me. I have a soft spot for squirrels so thank God you can hear a 37 coming a mile off or I'd never have been ready to take this vid! 37254 was leading, until recently in Swallow livery. She looks superb in Colas colours but still wish they'd left her as she was, Her uniqueness has been stripped. The joy of videos is you can find the perfect still. Had I tried to get this shot with the train travellng at speed I would never have managed. However, I love this shot, which reminds me of those pics you see of man eating tigers lurking barely visible in the undergrowth. The shy, retiring Class 37 lurking! Knowing the train would stop a while in Norwich I headed to Postwick Park & Ride site, hoping that the Test Train might pass the Greater Anglian Short Set there. Alas not to be, but this time with 37057 leading the Test Train went past on unwelded track, bringing back memories of the past. I wanted to get a shot from the Acle Straight, and was in luck. 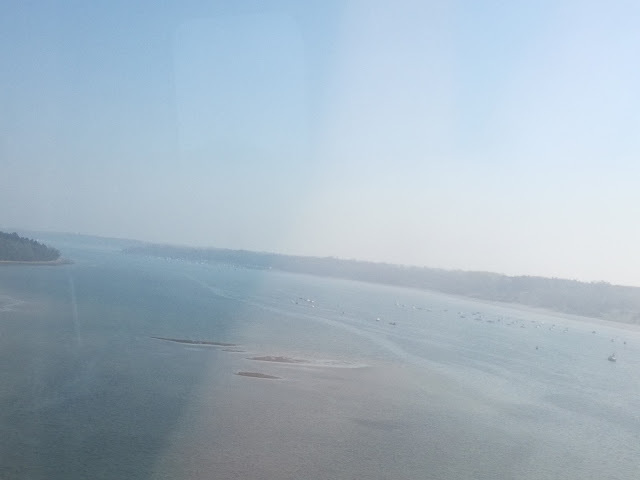 I had time to get halfway down the Straight to the bend - yes I know that sounds wrong but if you know the Acle Straight you'll know where I mean, where there is a bridge. I got on the bridge and waited 2 mins and took this. Couldn't dash across as a car was coming, hence the dodgy camerawork near the end. It was this video that has provided the new header pic, and I don't think I'll better it for a very long time. Getting that still was worth the day on its own. I got to Yarmouth veg market sorry Station and met up with Tim, who was there with a gaggle of other snappers. I took the opportunity to get a couple of shots of my favourite 12 wheeler! We were then joined by the Class 68 Short Set, now with Anglia MkII coaches. 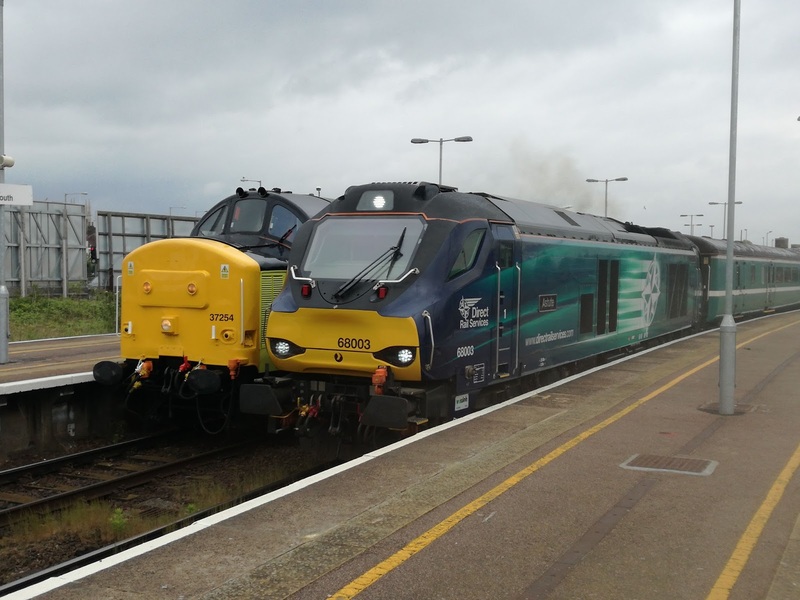 This could be the last time a double headed Class 68 meets the Test Train, as it's rumoured from May a DVT will be used on the set. A couple of mins later 37254 idled out of the station still managing to look good! From there it was to Reedham, as we knew the Test Train was due to wait there for 30 mins, and it was a location neither of us had been to for enthusiast purposes. We met up with newly converted train buff and local radio DJ par excellence Grahame Bessey from East Norfolk Bus Blog and Reedham turned out to be a perfect location. Soon we could hear roaring in the distance and 37057 brought the set in. I admit to being in awe of the 37's. They look mean, sound mean, and are well over half a century old now. 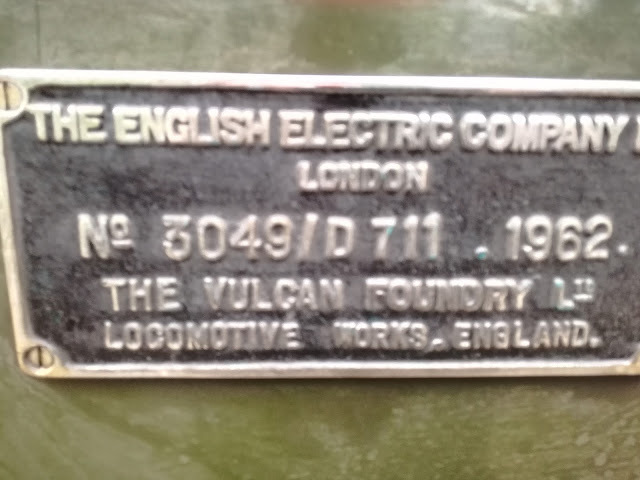 37057 carries this plate, which rather sums it all up. Born in 1962, still going strong. I make no apology for going overboard about this loco. I'm making the most of her being on the mainline for as long as I can, and she is so photogenic I just cannot resist! The most wonderful half hour then ensued, with both drivers getting out and chatting to us, not just about trains either - one of the drivers is a bird watcher and was fascinated by my visiting peacocks! A great couple of gents, who made the day for my companions, and promised me a show at Darsham later on. It honestly doesn't get much better, a decent conversation at an idyllic location with an idling 37 as a soundtrack! It summed up perfectly why I avoid the madding crowd as much as possible. 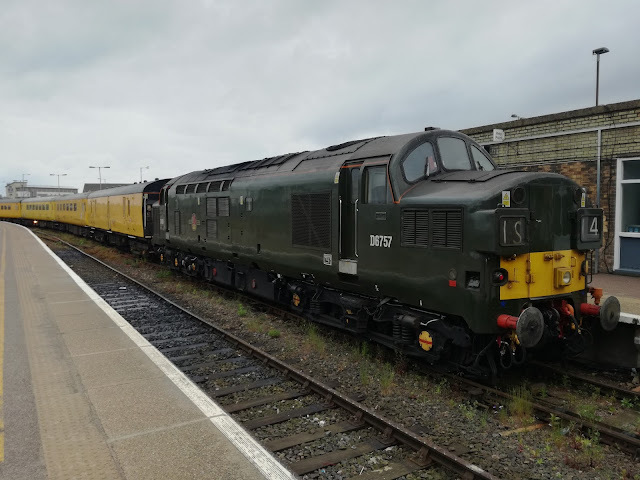 Anyway the Test Train rumbled off to Yarmouth again, and 10 minutes later part three of our Diesel Gala arrived in the form of the Greater Anglian Class 37 Short Set. 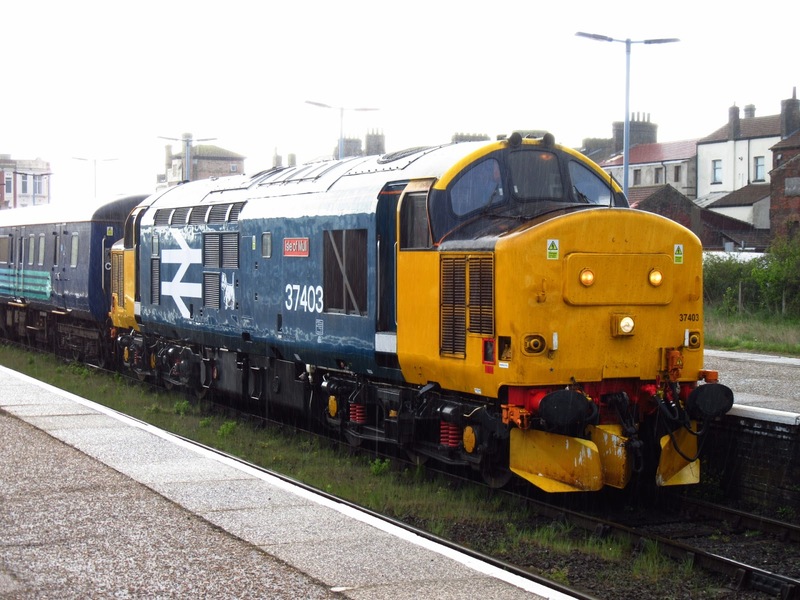 The snarling 37423 was leading with the immaculate large logo 37403 "Isle of Mull" on the back. There was also another funny photo opportunity. After the lurking in the undergrowth earlier in the afternoon 37423 decided to play a game of "peekaboo"! 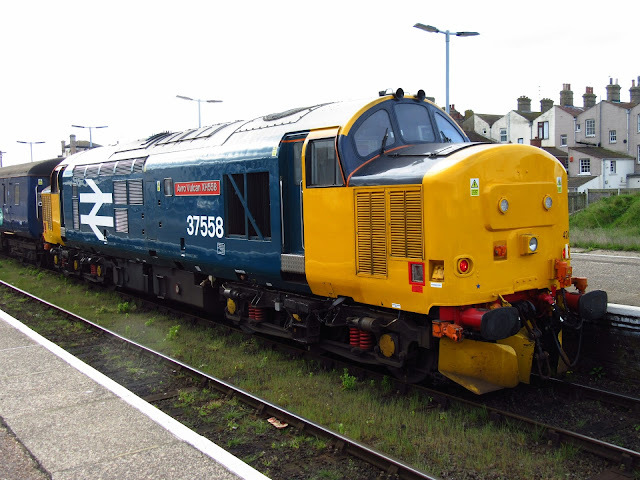 37423 is an angry beast, and she showed it as she pulled away from Reedham. Grahame departed and Tim and I returned to Yarmouth, where I picked up the car and drove home, but not for long. I still had one more thing to do and that was my regular video at Darsham. My battery was just about out at this point so I left it to the last second to start it. However the guys didn't disappoint and put on the promised show - cheers gents, hope we meet again soon. Today on a preserved line with a maximum line speed of 25mpg there were 5 locos. On the mainline, doing proper work on Thursday there were 6 locos. We are so lucky in East Anglia to have these hauled services and I'm going to really make the most of them over the next couple of years. I'm not knocking heritage lines in the slightest - they are working museums and are essential for preserving our railway history. In a few years it will be our only chance to see these magnificent locomotives in action, but until then I'll carry on finding new places to capture the locos for posterity, as I really don't want the same pics as everyone else has. Not much fun in that. 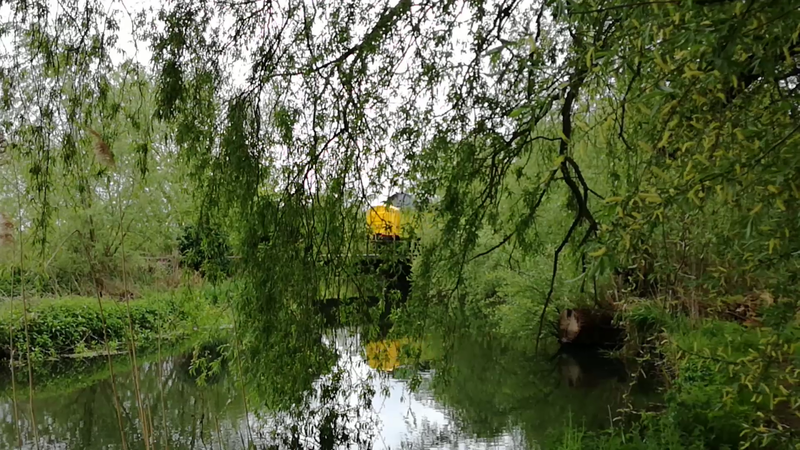 My thanks to Tim and Grahame for their company, the Colas drivers for being really nice blokes, the Norfolk Countryside for being so outstanding, but above all to the people who designed and built the Class 37 locos. I hope a lot of you are still around and take a real pride in yourselves whenever you hear one roar away as good as it was when it left the factory. You have brought a lot of people a lot of pleasure. Thank you. Addendum: Thanks to Richard Clinnick of RAIL magazine I can confirm that the 68 short set will remain top and tail with a DVT and 2 MkIII's. This is mainly due to DRS drivers continuing to man the 68's, who don't sign for DVT's! Thanks for the clarification, Richard. Thought I ought to let you all know I'm still alive. I know that news will disappoint one of you (only one I hope) but there are a few things to round up without any major news worthy of a separate post. The first thing hasn't even happened yet, but I'm pretty sure will in May, and that will be the Battle of Bungay. First's new X41 will start in competition with Anglian's 88/X88 and it should be pretty good viewing. 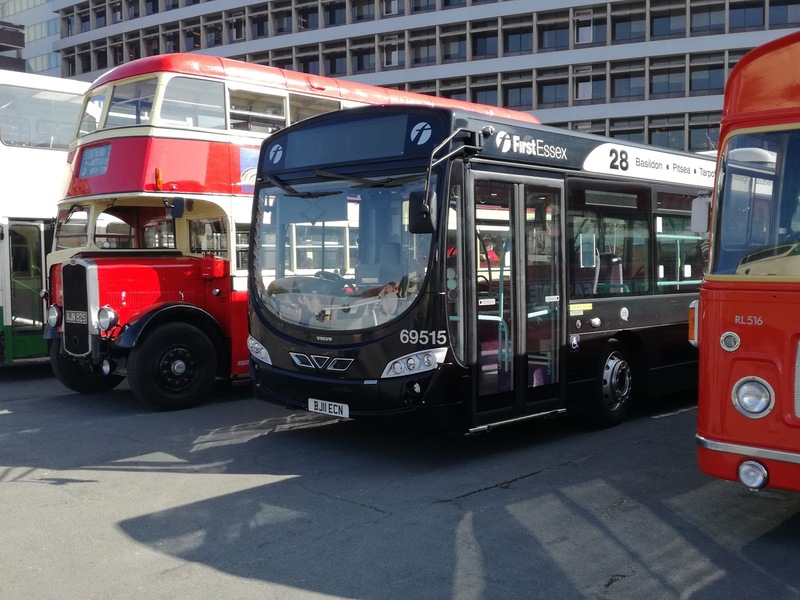 First are going to be using Streetlites on the existing 40, and Volvo B9's on the X41. Both with leather seating, WiFi etc. The B9's will be painted up into Grey I mean Charcoal Line colours. 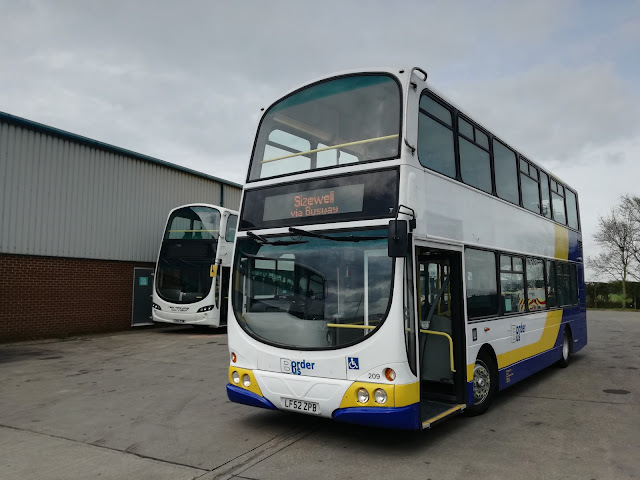 This has stung Anglian to the extent it is my understanding they have realised that hard seated Scanias with no WiFi are no match for the B9's, so will be using Konect E400's on the 88/X88, presumably the ex 8 ones with leather seats and WiFi!. Anglian have already slashed fares on the route and it will be interesting to see how First pitch their fares. However, First will have one distinct advantage - speed. No not Chris but journey time. Anglian have just increased journey times from Bungay by diverting the X88 through Broome and Ditchingham, ironically now making the X88 a longer journey time than the 88, and it is here I predict First to make rich pickings. Going straight down the main road to Norwich with no round the houses diversions I think will be very popular, and I imagine it will only be a matter of time before Anglian matches the fast service. All in all it could be quite a battle which I'll be watching closely while badgering First to extend to Halesworth! It was the Mid Norfolk Railway's Bus Running Day on Sunday. I didn't go. Tim and I though will be locating ourselves at Kimberley Park on Saturday for MNR's Diesel Gala which should provide many videos with much clag. So of course last night it promptly failed with an air leak. Well done Grahame. So this morning 424 was replaced with 403 and once again the Witch Doctor Bessey was at Lowestoft. And so it promptly failed. Way to go Grahame! Luckily though it was just a minor fault this time and 403 was back out in action after missing just one trip. I'm just waiting for 403 and 424 to be paired together if they can stay working long enough! Now that will be something to cherish and capture. I'm now going to have a moan, so if you don't like the thought of that stop reading. No one is forcing you or charging you to read so don't read it then slag me off. It has been many years since I have been able to read a newspaper without getting a headache. So I very seldom read them, which makes me hopeless at celebrity gossip, but I'm also not exposed to the inaccuracies and dodgy "interpretations" the papers can sometimes publish. However occasionally I am pointed in the direction of an article someone may think I'll be interested in, and this happened today, when a regular contact sent me a link to an article in the Ipswich Star, which you can read by clicking here. It is written by the Star's Transport Correspondent Paul Geater. Now I've never really taken much notice of this gentleman until he proudly proclaimed there were "scores" of buses at the Ipswich Bus Rally, something anyone who attended will vouch was certainly not the case. Now he has taken to the branch lines of East Anglia, and I have to say the article makes extraordinary reading. Mr Geater claims he tries to do this "at least once a year" yet reading the article you'd think it was his first time for decades. 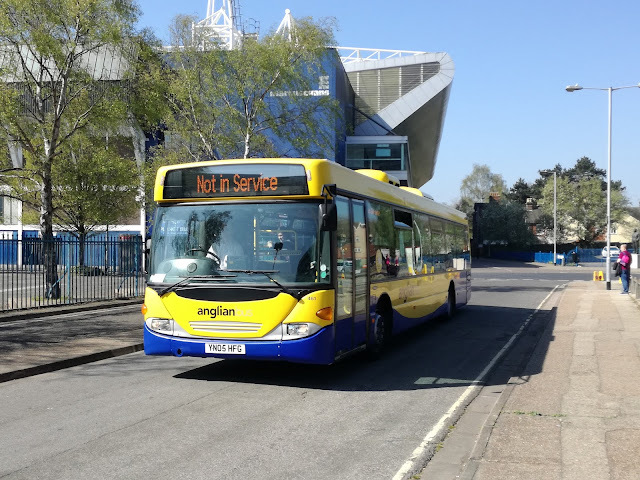 Starting on a 170 from Ipswich to Cambridge he remarks "It’s not as fast as driving along the A14 and Cambridge station is a 20-minute walk from the city centre, but it’s certainly a better way of reaching the city than it used to be!" It's also EXACTLY the same as it was last year, or the last 17 years since the 170's were introduced at the turn of the century. You would have thought a regular traveller would know that, let alone a professional journalist. "I had to change at Ely, but I actually arrived in Norwich 10 minutes earlier than I had expected. 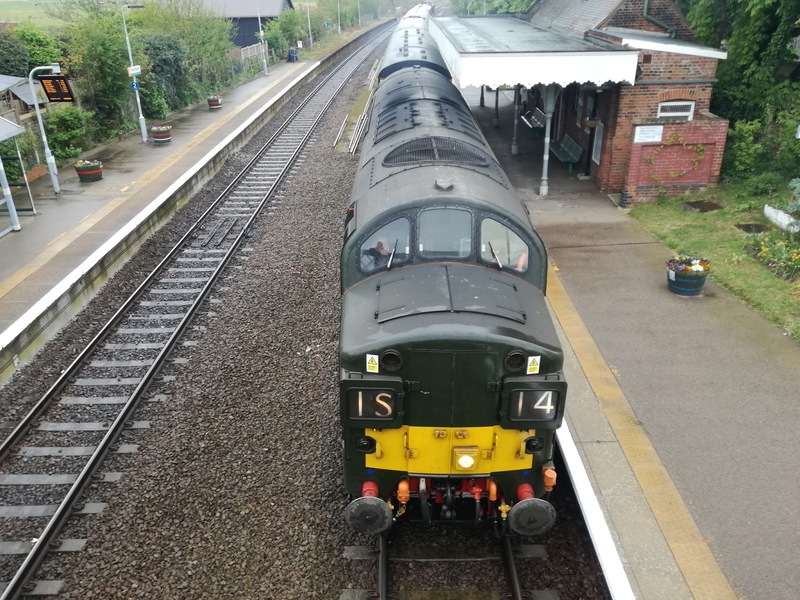 I had to stand for the 10-mile trip from Cambridge to Ely but that was no great hardship, and I had a seat for the attractive journey through Breckland." Oh that's ok then Paul. I'm assuming you weren't in a wheelchair, or pregnant, or with a couple of toddlers or an elderly relative. I'm pretty sure anyone in that position would have found it a much greater hardship, as I'm sure they would have found changing platforms at Ely, which has one of the longest underpasses on the planet. It's also reassuring to know you weren't penalised time wise as getting to Norwich 10 mins earlier must have been a bonus (don't you check timetables before setting out?) but it's just as well you weren't travelling to Attleborough or Wymondham, or indeed Brandon and possibly Lakenheath as I'm sure your EMT train didn't make special stops at these stations so anyone travelling there would have been delayed the full hour. But never mind them eh! The next trip was to Yarmouth via Berney Arms on a single car 153. He writes "But I’m afraid I’m not eulogising over the single-car units. There’s a reason some enthusiasts call them “Scuds.” Well I have researched this, and it seems the units are called Scuds because like the scud missile, whose accuracy wasn't exactly 100% , the 153's could turn up anywhere, so not sure what Mr Geater's interpretation of the word is. They have also been around for the best part of 25 years, the Eastern units making their debut on Mr Geater's home line, so why make it sound as though it's the first time you've been on one? Then the coup de grace; "Highlight of the day was the trip from Norwich to Lowestoft along the most attractive line in East Anglia in a train made up of three beautifully restored 1970s-built coaches and top and tailed by a pair of ultra-modern Class 68 diesel locomotives." Just one problem. Those coaches had gone by time the article was published, now replaced with old Anglian ones, and the 68's haven't been here nearly as long, or will remain nearly as long as the 37's, which I doubt Mr Geater has any idea about. He kept referring and comparing to when he was a teenager in the 60's, but if he does this trip every year why doesn't he compare to last year, or 5 years ago? Why no comment on the lack of through trains to London from Lowestoft and Bury. He declined Felixstowe as he couldn't bear the thought of another 153 yet that is the branch line at most risk currently due to the increase in freight traffic. Nothing about frequencies, or connections, or ticketing facilities on branch lines, or disabled access, or co-ordinated bus connections, or fares. But hey he got to Norwich earlier using two trains instead of one. Yes I will be applying for the job when Mr Geater retires. At least I try to get my facts right. One to look forward to - thanks to Megabus I am nipping down to Plymouth in June to catch up with the former Anglian gas buses, to see them in their new home and remind myself how good they are! Just the one day, catching the overnight coach in both directions on consecutive nights, but it's cheap! Would have cost well over £100 on train, £80 in petrol, but Megabus Norwich - London - Plymouth return? £10.50! Cheers! Oh - just checked National Express for same days and times - £32.40! Finally my thanks to all who have written over the last couple of weeks, including a couple of really surprising and touching ones. I made it clear I wasn't after the sympathy vote, but your emails and phone calls have made a great difference, and is why the blog still exists. Next post will be the Diesel Gala review. First of all my apologies - there was meant to be a big London themed post over this weekend but I was relying on a contribution from a third party, who has let me down. So the post won't be published. Reading through the comments from the last post one of them stuck out, and I suddenly realised how applicable it was to me. This was the comment. If you want to ride in service buses, I expect you'd have to pay some money to the companies and go out and do that on any average weekday. The event was voluntary and provided by people in their spare time, at their own risk, for the enjoyment of people they didn't know. If you want to read industry magazines I expect you'd have to pay some money to the publishers, and go to a newsagent to get them. This blog is voluntary and provided by myself in my spare time, at my own expense, for the enjoyment of people I don't know. I do not make a penny out of this blog.In fact there are considerable expenses involved in it. It is a hobby which keeps me involved in the industry I love and know. I don't always get it right, I don't claim to. If I get it wrong I'm happy to accept correction. I give others the right to pass comment on what I do without having to reveal their identity, which has led to abuse and invitations to take my own life. The views and opinions I express are honest, and not driven by bias, outside influence or personal vendetta. I don't get any help whatsoever with the production or compilation of the blog, with the invaluable exception of Tim helping share travelling costs on occasions. Through this blog I have made some amazing friends, young and old, from cleaners to drivers to top management, and of course fellow enthusiasts. It completely took over my life at one point and my health suffered as a result, but not now. I was hoping it might lead to some professional, paid work, but that hasn't happened either. I'm hoping it still might but not holding my breath. I won't be posting as much from now on. I thought about closing the blog as it seems I'm either getting abused or let down at present but no reason to let those people beat me. However I'll now post when I want to, rather than because I feel I ought to. If I get news I'll publish it, but won't worry if I don't have anything to publish. I'll continue to review new vehicles, challenge operators and councils and enjoy my hobby. I hope you'll all stay with me, well one of you can bugger off, and keep checking for new posts as and when they go up. So I can't be accused of fishing for sympathy or compliments I have disabled comments for this post. However, if anyone emails I will reply. Always risky planning an event for mid April, but today the sun shone on Portman Rd in Ipswich for Ipswich Bus Rally. I went there with Tim, chauffeured by Grahame Bessey, DJ extraordinaire and co author at East Norfolk Bus Blog, whose owner Roy Northcott also attended. Zak from Norwich Bus Page was there as was Sam from Norwich Buses Blog, and of course Clive Nixon of Ipswich Bus Blog. So the bus blogging world gathered in expectation of a repeat of what I'm told was a great event last year. First Ipswich, Ipswich Buses, Carters Heritage, Beestons, Galloway, Simonds, Borderbus, PH Travel, JR Travel, Whincops, Norse, Network Colchester, Stephensons and Hedingham were just some of the local companies who didn't support the event. Very, very disappointing and not a good advertisement for the industry. Even Ipswich Transport Museum, who were allegedly running the event didn't supply much, not an Atlantean in sight. 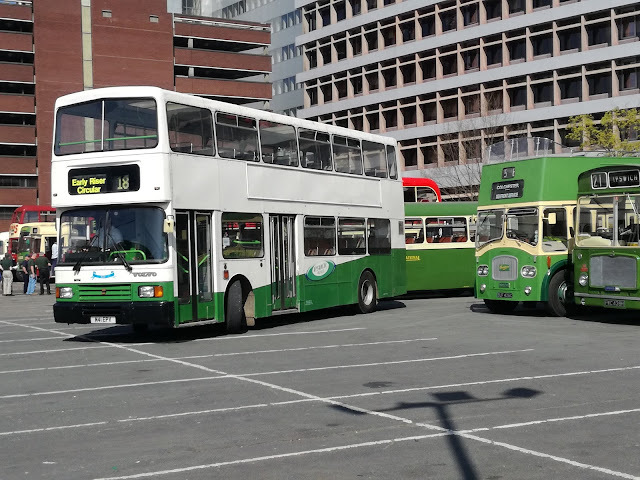 So my thanks go out to those who did bother to send vehicles, including First Essex, Anglian, Chambers, Mulleys and Panther, and all the privately owned buses cared for tirelessly by enthusiasts. You can hold your heads high. Everyone else who either got caught up in petty squabbling or just couldn't be bothered you have let a lot of people down today, including yourselves. 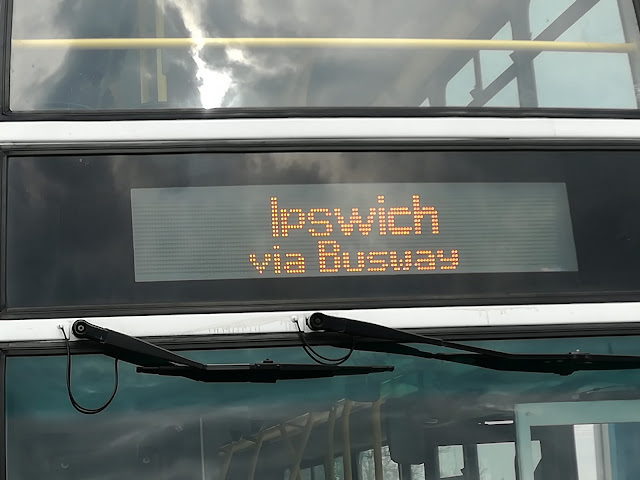 I expected to spend the day riding on various buses around Ipswich but in the event only went on one - mind you that was pretty spectacular. 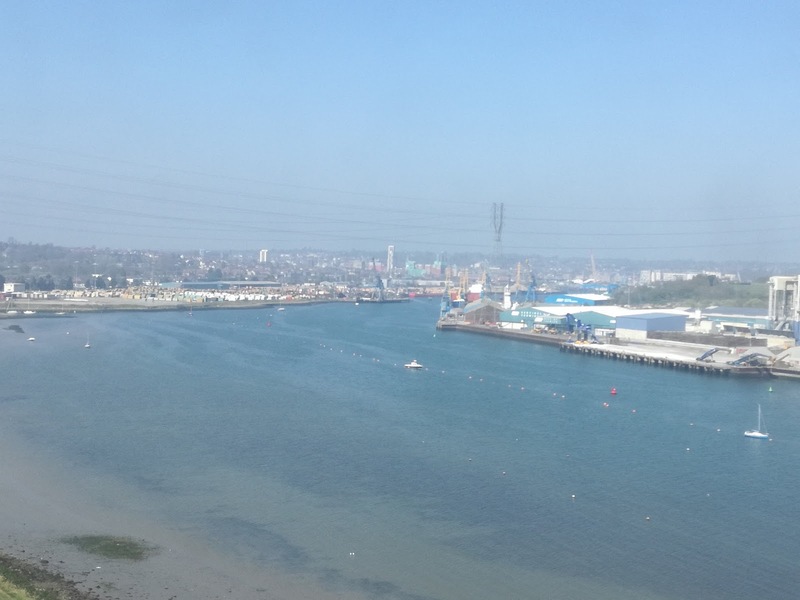 Leon Wells brought his ex Ipswich Buses Olympian to the event, and gave us a superb 2 way trip across the Orwell Bridge, which on a day like today provided some simply staggering views you rarely get a chance to see. Thanks Leon, for keeping the Ollie in such good nick and for picking such a good route taking advantage of the weather. Anglian surprisingly brought along Scania Omnicity 461 YN05 HFG, the first Anglian vehicle I have seen in Ipswich since their 164/5 services were abruptly scrapped in 2013. Another surprise exhibit was First Essex Volvo B7rle 69515 BJ11 ECN, formerly Chelmsford P&R the bus is now branded up for Basildon - Southend services. My favourite bus of the day though was this ex Metroline MCW Metrobus. GYE 394W is part of the Great Yeldham collection and yet another bus coming up from Essex. Suffolk was seriously under-represented. However, very sadly, the Metrobus didn't go out on any trips which was a shame. The usual collection of Bristol RE, LH's and VR's were there as well as the regular older vehicles. But on the whole despite the glorious weather the event was rather a damp squib, and had it not been for the good catch up with friends would have been a waste of a day. So thanks for coming everyone, good to meet some new people, put faces to names and having a darn good gossip. I hope if there is an event next year more effort is made to encourage Suffolk operators to attend. I'll finish this post with photos taken from the Orwell Bridge, which quite honestly was the highlight of the day. Look out for some posts from London later in the week and over Easter. Wednesday could be an epic day! 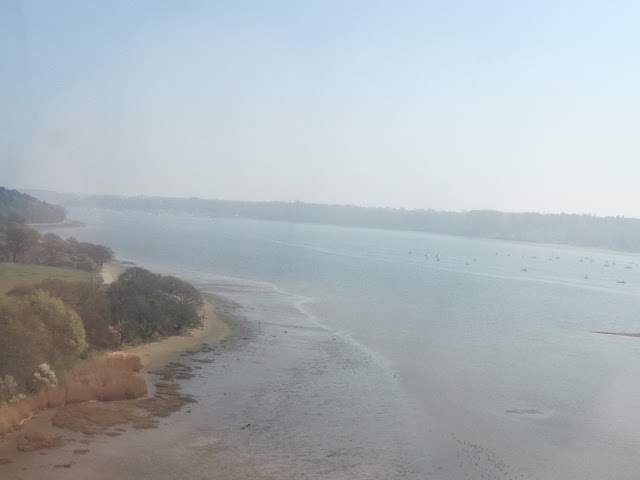 Wouldn't guess it was Suffolk would you! A spur from the Busway at Martlesham where current railway passes under the A12 so Sizewell C construction traffic can access the A12 where it is dualled without having to travel through local villages or the single carriageway section of the A12. Plans include Park & Ride site for Sizewell workers. 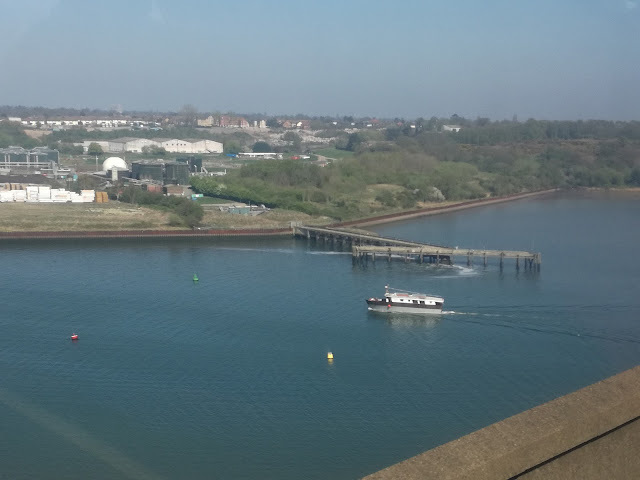 The section of line between Westerfield and Bacon Curve will be widened, including new bridges so current Felixstowe traffic unaffected. Platform 1 at Ipswich will be converted to Busway to provide direct link and transfer between Busway and National Rail. 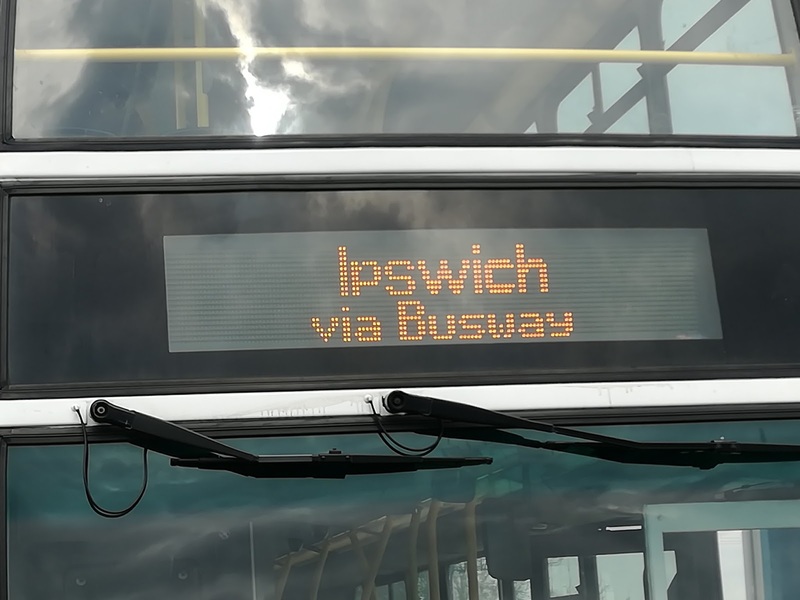 The buses will then continue into Central Ipswich. 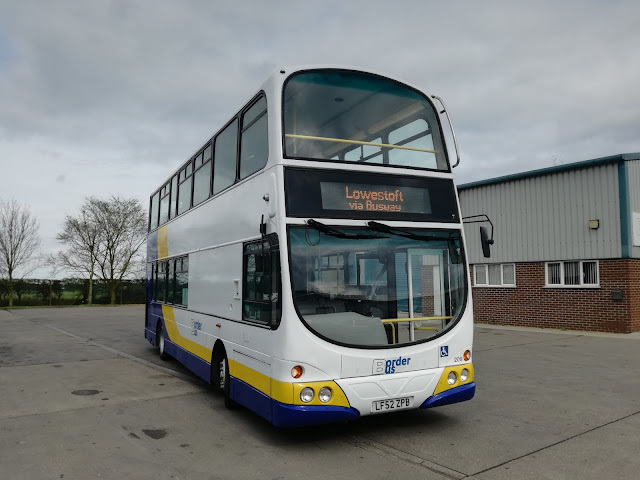 It is envisaged at the Lowestoft end of the Busway buses will continue from Lowestoft Station into Lowestoft and beyond. 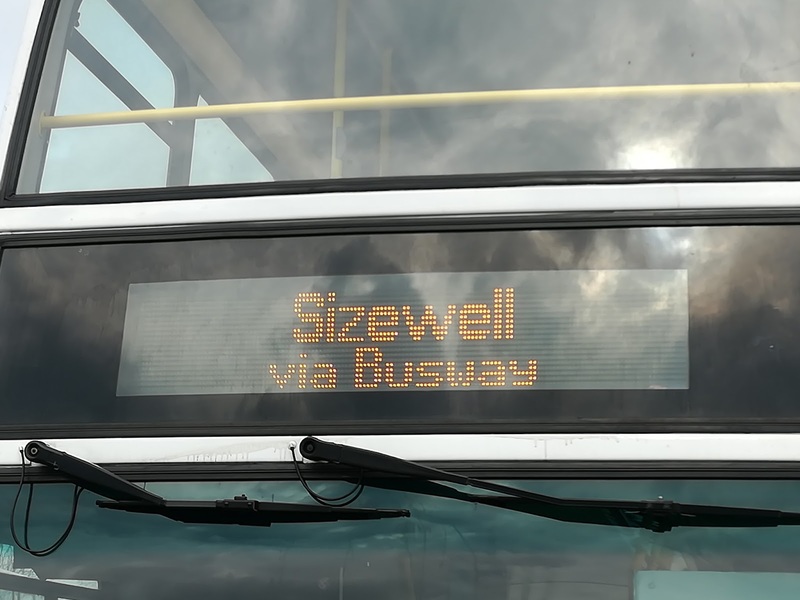 It is expected local buses will link up with the Busway at hubs in Woodbridge, Saxmundham, Halesworth and Beccles so as many people as possible have access to the fast buses. Integrated fares with National Rail will be available so commuters using both guided bus and train will not be adversely affected financially. The reasons for this project are explained thus. It works out cheaper to convert the ESL to busway than restore the Sizewell branch to full working capacity, coping with large amounts of traffic. There has been local opposition to the amount of extra road traffic including many extra lorries and construction worker's cars. Financial incentives will be given to workers to leave their cars and use the Busway to get to work. This will negate the need for the A12 to be developed, including bypasses and huge P&R sites which will just increase the traffic. So who will be operating the services? This is yet to be decided as the decision to build Sizewell C has not yet been finalised. However, a certain operator's eyes lit up at the thought, and kindly agreed to show us what the destination might look like. A Gemini up the ESL? So what do I think of this? Mixed feelings but can't help thinking it actually makes sense. Railways are costly to maintain and operate. The East Suffolk Line isn't the fastest around and buses will actually be able to reduce journey times considerably. Restoring the whole line to two way traffic will mean a much increased service pattern, and will do wonders for tourism too. With the dawn of electric buses it could become the greenest transport system around. Taking the threat of all the extra traffic from the construction of Sizewell C will go down very well with residents of places such as Yoxford, and Leiston will benefit greatly from the new faster services which should help property prices and encourage investment. Obviously there will be some who vehemently oppose these plans. The ESL holds many memories for a lot of people, but I think this plan actually secures the route's future for generations to come, and means it won't just be abandoned to grow over if the money to maintain it runs out. I'll miss the test trains, but the reduced travelling times, and cheaper fares, which are essential, should see the route gain in popularity, and like the Cambridge Busway, attract enthusiasts to the area in their droves. All that is now required is Sizewell C to be built. I hope it is. Then sights like this may become reality. My thanks to Andrew and Colin at Borderbus for their help with the pics, and I have a feeling sights are already being set for the future!